When a railway worker Narhari Chitalkar living in Puntambe - a small town in Maharashtra - got a son on January 12, 1918 and named him Ramchandra, little did he know that his son would never be called by the plain and simple name 'R.N. Chitalkar'! From the early age young Ramchandra was fascinated by music and drama. He left for Kolhapur after leaving the school in ninth standard and tried his hand at acting. At the age of seventeen he bagged a hero's role in 'Naganand'- a film which bombed heavily at the box-office. After this early setback he moved on to Bombay. His training in classical music from Shankar Rao Sapre came in handy to bag a job as a music assistant in Minerva Movietone where he started working with the then leading music directors Mir Sahib and Bundu Khan. Soon, thanks to his ability to write notations of the tunes, he became an important cog in the wheel. His debut film as a music director was in Tamil films with Jayakkodi and Vanamohini. 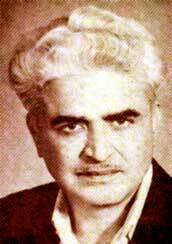 He got his first Hindi film, Bhagwan's Sukhi Jiwan, in 1942. Ramchandra's juvenile songs may be sub-divided into those with highly westernized male and / or female choruses, duets or quawwalis. The mood of these songs was zany, saucy, raucous, irreverent, mischief-laden..joyful noice. The composer's natural ebullience, boyish vigor and state of camaraderie with the young man of the Hindi cinema are evident here. It was 'let's have a good time' music; on the screen the purveyors of these songs were either the raunchy comedy team of Yakub and Gope (Patanga, Saaqi, etc.) or the funnyman Bhagwan (Albela, Shin Shinaki Bubla Boo, etc.) who was often Ramchandra's juvenile persona on the screen. An outstanding feature of many of these songs is their intense curiosity about western mores and manners; they often employed western musical idioms in exaggerated fashion either for satire or irony. These songs mirrored the curiosity of the educated, urbanized Indian youth of British India regarding their colonizers. Popular belief has it that Ramchandra introduced rock 'n' roll in India before it became a rage in the west. This is a paltry statement in the face of his numerous experiments in western/Indian and middle-eastern styles. For example, in 'Meri Jaan..Sunday Ke Sunday..' (Shehnai) he introduced the Benny Goodman style of jazz clarinet in combination with an Indian melody. The song is infused with hilarious verbal and musical incongruities resulting in a comical effect. Other westernized songs e.g. 'Shola Jo Bhadke..' and 'Ye Diwana Ye Parwana..' (Albela) employed cabaret type dance feturing bongo drums, oboes, clarinets, trumpets, saxophones, etc. The spirit and atmoshphere of these songs convey much hilarity, exuberance and gaiety of the sort one finds in opera comique of Jacques Offenbach. Bhagwan - a leading comedian and film maker of that era - spotted Ramchandra's musical talent and offered him his film 'Sukhi Jeevan' as a composer. That year was 1942. At the age of twenty four a glittering career was about to begin. The promise turned into reality with hit soundtracks like 'Lalkar', 'Safar', 'Samrat Chandragupta' and 'Bhaktaraj'. It was during the making of 'Bhaktaraj' he was re-christened 'C.Ramchandra' by the film's producer Jayant Desai. This screen name was to stick permanently. Only when he would sing his own songs the records labeled him as Chitalkar. So as a composer he was C.Ramchandra, as a singer he was Chitalkar and to the near and dear ones he was simply Anna! The fifties saw him emerge as one of the leading lights of Hindi film music. His music in films like 'Nastik', 'Shagufa', ‘Sangeeta’, ‘Kaarigar’, ‘Khazana’, 'Yasmin', ‘Teerandaz’, 'Shinshinaki bublaboo', 'Parchhai' and 'Yasmin' is still remembered fondly by nostalgic music lovers. But for the common listeners his introduction is through his more popular soundtracks - 'Anarkali', 'Albela', 'Aazad' and 'Navrang'. His music had a superb mix of melody and rhythm. Exceptional blending of piano, violins, tabla, dholak and khanjiri gave unique freshness and liveliness to his tunes. If Kishore's Ina mina dika and Asha's Mister John o Baba Khan showed his trendiness then Talat's Mohabbat hi na jo samajhe or Rafi's Yeh hasrat thi vouched for his mastery over emotional stuff. But his musical association with Lata Mangeshkar was something really special. Their songs are in a league of their own. Even if you haven’t heard hidden gems like Ab woh raaten kahan, Jo mujhe bhulake chale gaye, Bheeni bheeni hai or Tum kya jaano, just take the well-known popular songs like Mohabbat aisi dhadkan hai, Radha na bole re, Dheere se aaja ri ankhiyan mein or Kaise aaoon Jamuna ke teer and the terrific chemistry that they shared is all too apparent! Even today's audiences go gaga over 'Albela's Lata - Chitalkar duets Shaam dhale khidki tale, Shola jo bhadke and Bholi surat dil ke khotey. Over all these years theatre screens showing these songs have never failed to be showered with coins thrown by the frenzied fans. The jazzy rhythm of this Bholi surat was played by a toilet- cleaner on a tin pot. Can you believe it? He did many such unbelievable things - like adapting from a Marathi naatya- geet (Murtimant bheeti ubhi) the evergreen 'Anarkali' classic Yeh zindaghi usiki hai, converting another naatyageet (Sukhvi Tula) into the Parchhai- delight Naina Lagake Dukh De Gayo, using the maddham from an Islamic qawwali to create that bewitching beauty Dil ki duniya basa ke saawariya and composing the entire soundtrack of 'Azaad' studded with sparkling songs like Jaari jaari o kaari badariya, Dekho ji bahar aayi, Kitni jawan hai raat, Kitna haseen hai mausam and Aplam chaplam in just seven days! Lata reckoned him to be the fastest composer she ever came across. Those who lavish extravagant praise - richly deserved, of course on the filmi ghazals of Madan Mohan and Khaiyyam, forget that C Ramchandra composed some of the most exemplary song in this genre. One need only to point to those sung by Lata or by Talat Mehmood in Parchhain, Yasmin and Kavi. Furthermore, those who simplistically claim that Lata Mangeshkar was at her best under Madan Mohan's baton engage in cruel, selective memory. Song upon song composed by Ramchandra for Lata Mangeshkar belie those contentions. Moreover, it is conveniently forgotten that Madan Mohan worked under Ramchandra for the songs od Shabistan (1951). No wonder, then, that Madan Mohan's music has an underlying Ramchandran flavour. The supreme lyricism of their melodies united them; further, their orchestra had similar sound and ambience. Except that Ramchandra's string section (violin) had a more dancing , 'waltzing' sound. In a Madan Mohan song the 'waltzing' effect was more muted, to create a more somber sound. It is noteworthy that although C Ramchandra was most commonly associated with lyricists Rajendra Krishan and Santhoshi. In Anarkali he worked with three lyricists, Krishan, Shailendra, and Hasrat Jaipuri. In his later he employed Noor Lakhnavi (Parchhain), Jan Nissar Akhtar (Yasmin), Pradeep (Nastik), Shakeel Badayuni (Zindagi Aur Maut) and others. The diversity of poetic sources notwithstanding, his style remained intact. His finest hour came through his non- film composition Aye mere watan ke logon. Composed for an army welfare programme after the Indo - China war (1962) and sung by Lata, this emotional patriotic number even moved the then Prime Minister Pt. Nehru to tears. Such was the impact of this song on Nehru that he embraced the composer on stage! But soon after that heady success, slowly but surely he lost his ground to the newcomers. His soured personal and professional relationship with Lata definitely contributed to his downfall as he could never really find the same magic with other playback singers. The few soundtracks in this period (Bahurani, Stree and Jitne Door Utne Paas) where he got Lata’s vocals back again, he came up with superb compositions like Main jaagun saari rain, Jhilmil jhilmil, O nirdayi preetam and Humne apna tumhen samjha. But the decline in the quality of his music was all too evident in most of his 'sans Lata' soundtracks. 'Navrang' was perhaps the only soundtrack where he could shake off his Lata-fixation and succeeded with Asha – Mahendra Kapoor combine. Songs Aadha hai chandrama, Are jaare hat natkhat and Tu chhupi hai kahan had the same spark as before. After 'Rootha na karo' (1970), he didn't compose for Hindi films. Last few years of his life were spent in composing music for non-film songs. On January 5, 1982 - a week before his sixty-fourth birthday he left this world.